Yesterday I went to see the newly opened reconstructed Temple of Mithras in London - and it is really impressive. The temple is underneath the Bloomberg building on Walbrook, and is now part of a three-floor installation and gallery. On the first floor there is a display of finds from the archaeological dig on the site, which you can explore using a tablet device that you get handed as you enter. On the stairs, as you descend to the lower levels, are depictions of the layers of history you are passing through and what was in the area at different dates in the past. The second level has an introduction to the the practices and symbols associated with the cult of Mithras, with interactive screens, models of cult items and an audio-visual display. The temple itself is on the lowest level. Although you aren't allowed to walk on the actual stone of the temple floor, you can walk around it and over it on transparent platforms. As you enter, the lights dim and you see and hear a reconstruction of what a Mithraic ritual might have been like. I found it a very powerful experience. Then the light levels are raised and you can explore the temple and look at it in more detail. You are allowed to take photographs, but not with flash, which is why the photo at the top is a bit grainy. 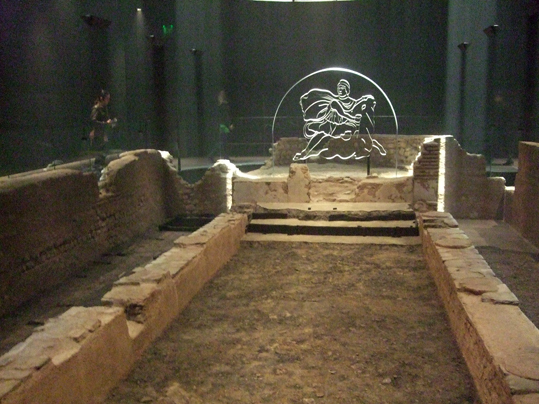 You can visit the London Mithraeum free of charge, Tuesday to Sunday, from 10am to 6pm, although advance booking is required via londonmithraeum.com. I went with a group of friends a couple of weeks ago and thoroughly enjoyed it. We had a private guide as we were doing Roman London and gained great insight into the temple. I was so impressed, going with hubby n teen this weekend.